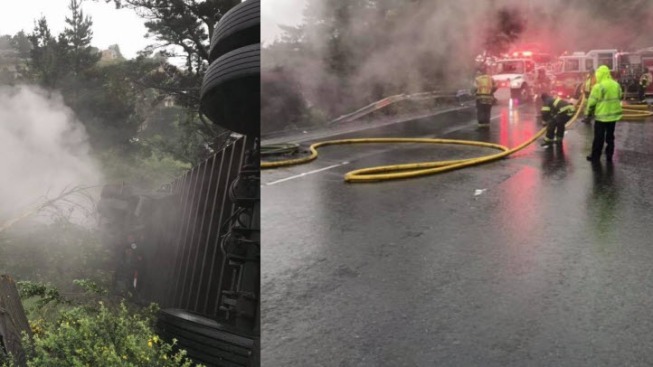 Two lanes reopened on northbound U.S. Highway 101 nearly three hours after a big-rig rolled, crashed and started a brush fire Friday morning, according to the California Highway Patrol. The truck's driver escaped by smashing a window in the cab with a fire extinguisher, according to the California Highway Patrol. The crash was reported about 8:40 a.m. along the freeway north of the Golden Gate Bridge just before the Robin Williams Tunnel, the CHP said. All lanes were closed after the crash. Two lanes reopened about 11:15 a.m. and two lanes on the freeway remained closed so that Caltrans crews can repair a guardrail, the CHP said. There's no estimated time to reopen those lanes. US 101 NB at Spencer Ave. all lanes are blocked by a big rig collision and fire. No estimated time to open.